A round-up of new nonfiction titles focuses on plenty of pets. 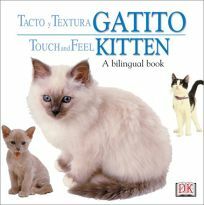 Two bilingual board books introduce youngest readers to their furry companions in Touch and Feel Kitten: A Spanish/English Word Book and Touch and Feel Puppy: A Spanish/English Word Book. Die-cut covers let readers feel a feline's ""fur"" in Kitten, and later a ""tongue,"" with appropriately simple text: ""Toca mi lengua spera y rosada./ Touch my rough, pink tongue."" Puppy follows suit, with photogenic canines who like to play.